For anyone keeping track, you�d have noticed that Remedy has been releasing major Death Rally updates in about one month spans up through July and now it has been three months since the last. In my opinion, the wait was totally worth it because today�s update includes the long awaited multiplayer, plus a few extras. As of now, the feature is being listed as beta status, although, that doesn�t mean it isn�t enjoyable. Anyway, the multiplayer area can be accessed by tapping on the top-right button in the main screen. The interface is very similar, except your vehicle is displayed outdoors instead of in a garage. A much more significant observation that hasn�t likely slipped by your keen vision is that the multiplayer campaign is separate from single player mode. Basically, any progress you have and do earn in single player isn�t transferred to the multiplayer side and vice versa. On the other hand, Just like single player, map selection is randomly generated and only a handful of choices are displayed. It isn�t clear yet whether or not the behavior is temporary, but the multiplayer courses are not offered in reverse or other variations and there are no challenges. Even though the update hasn�t been out for a lengthy period of time, waiting times to collect players seem extremely reasonable. On average, I experienced a wait time of around one minute. With that said, I did have some instances where the game was making a final connection of all racers and the action would be oddly delayed or drop entirely. Ultimately, I am very pleased with what Remedy has done so far and the multiplayer side should only get better. * FANTASTIC NEW WEAPON: The Flamethrower is now included in the 1st Reward Booster pack! * NEW CAR PAINT JOB: The Retro Fighter for Shrieker. * Enhanced anti-aliasing for iPad 2. 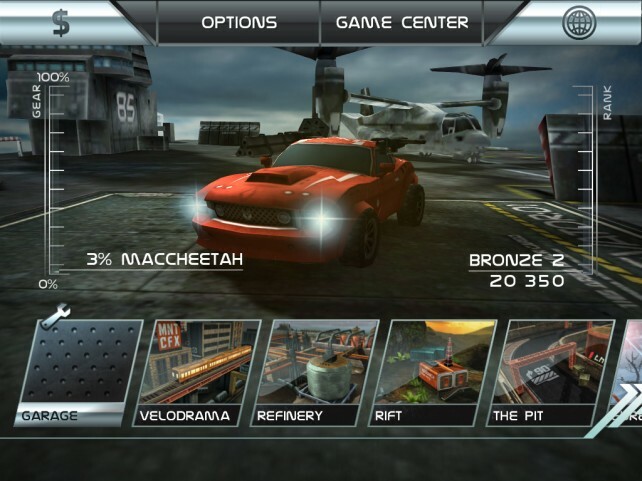 Death Rally is a universal app compatible with iPad, iPad 2, iPhone 3GS, iPhone 4, 32GB and 64GB third generation iPod touch, fourth generation iPod touch and newer running iOS 3.2 or later, and available in the App Store for $.99.